Ben Goldfarb is that rare breed of science writer who could probably turn a dishwasher manual into a page-turner…but let him loose with an already-intriguing topic like the beaver, and he’ll deliver a book that’s an absolute pleasure to read. In Eager, Goldfarb unveils beavers’ profound influence on the landscape of North America. Our waterways behaved very differently when the beaver, fluvial geomorphologist extraordinaire, had the run of the continent. Beavers nearly disappeared from the land by the mid-1800s, largely due to trapping for their pelts. The sudden dearth of beavers was a calamity for biodiversity and water availability, particularly in the arid West. 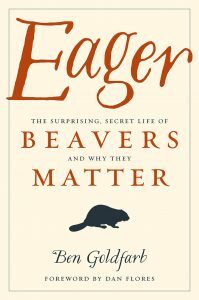 Eager reveals this unexpected history while showcasing the efforts of a diverse (and entertaining) army of “Beaver Believers” who work to restore our continent’s largest rodent. I love to learn about the history around Southern Maryland and am fascinated with the islands that are just off our coast. Many of these islands maintain some of the customs and even language of another time. 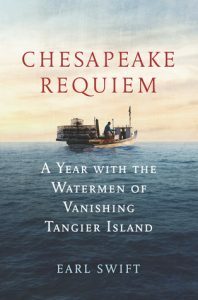 Chesapeake Requiem is a very interesting read about Tangier Island off the coast of Virginia and Maryland. Swift, the author, spent an entire year living on the island with the locals. He goes in depth on the climate and geographical circumstances that created Tangier Island and continue geographical changes as well as the history of its people from the island’s “discovery.” This is a fascinating history of the people and how the island was settled. I loved reading the stories of the families on the island. The islanders rely on crabbing as their way of life and are often at odds with the laws and climate change scientists on the role the Chesapeake Bay plays in their lives. The Chesapeake Bay has been encroaching on the island for hundreds of years. The land has significantly reduced in size and even graves are submerged in many feet of water with gravestones washing on shore. The island’s inhabitants are aging and many of the young people are leaving for the mainland for jobs and education. The way of life on the island is threatened by the shrinking population and the shrinking island. One day soon, the island will be reclaimed by the Chesapeake Bay. This is a great read and I highly recommend it! Find it here.